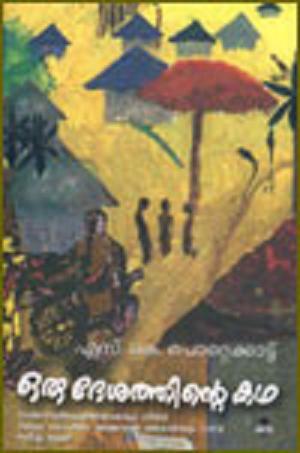 The story revolves around the initial 20 years of the protoganist Sridharan's life in the Malabar village called 'Athiranippadam'. While Sridharan's life is of moderate importance and interest, it is the happenings and people of Athiranippadam and Sridharan's relationship with his father Krishnan Master that makes up the core of the story. The story begins with the birth of Sridharan and continues till he is about twenty. In between the reader is taken through numerous happenings in the village, hundreds of characters who make up the natives of the land and anecdotes concerning them. Sridharan's relationship with his father who was an epitome of truth and dharma also has been described. Sridharan finally is forced to leave the village when his father dies. The author winds up with Sridharan returning to the changed village about 30 years after. He gets to know what happened to most of the people of the village after he left 30 years before, from'Velumooppar' who is still alive (Velu was a carpenter in Athiranippadam). The are numerous fascinating things about this novel. The amazing charecterization of almost a hundred characters and the stories of their lives. The most interesting of them being Kunjappo, Sridharans elder brother. The roles Kunjappo plays in his life starting from being a military man and then to a painter, railway workshop fitter, Congress volunteer and the related happenings are a treat to the reader. The magical world of Ilanjippoyil. Ilanjippoyil is village which is half forrest and half agrcultural land where Sridharan goes to stay during vacation. One would not believe that such a world exists when he reads Sridharans adventures in the jungle with his friend Appu. How many unheard birds does he hear singing! How many unheard fruits does he eat! How many unheard trees does he climb! 'Supper Sarkkeett':- The midnight mischieves done by Sridharan(referred as 'Minor' by his senior friends) and his friends are more than entertaining. The historical legend of the rich Kelanjeri family and how Athiranippadam sees the decline of the family, thanks to the spendthrift drunkard 'Kunjikkelu Melan', who was the last heir of the family. There are more than a few moments where the reader may feel his eyes getting wet:- when Sridharan comes to know that Narayani is dead(Sridharan was emotionally attracted with the crippled sister of Appu); when Sridharans loving brother Gopalettan dies; when Krishnan Master dies and when Sridharan finally leaves Athiranippadam. There would be a hundred oringinal characters in the story. (All of them are normal people like carpenters, toddy workers etc)Its unbelievable how the writer explains the history and heroics of each and later relates them to the central story and happenings. The reader is left to wonder whether such a small village would have so many interesting people! The writer of this review wonders how much autobirographical the novel is. Does Athiranippadam really exist? If yes, did all of people mentioned live there? Or has the writer fit all the interesting people he met in his life into the imaginary village called Athiranippadam, much like what RK Narayan did with Malgudi? If that is true, the writer has done a commendable job in relating the character introduced in say 50th page into a happening say in 400th page. teenage love affairs are poetic. The writer also has narrated the ripples caused by different historical happenings (like the Mopla Revolt or 'Jagala'of 1921 and the Civil Disobedience Movement of 1930 during the period) in the village. These are interesting to say the least. with the different people of the village. Altogether a very engaging book, the reader would be left with the hangover at least for a couple of days. A must read in Malayalam or even Indian literature, creations of such magnitude are rare to find! Good One Narayanan! Thanks much. I want to learn about the story of s. K. Pottakatt' oru dheshathinta katha .